Our current Necromunda campaign, 'Not another chaos uprising!' comes to a climax this week. As with previous campaigns, we will be rewarding player achievements through the awarding of trophies. Given that the theme of this campaign has been centred around a swelling of chaos cult activity, I chose to make the new trophies chaos themed. The five trophies have been made simply by pinning five plastic 40k chaos cultists to resin display bases from Model Display Products. 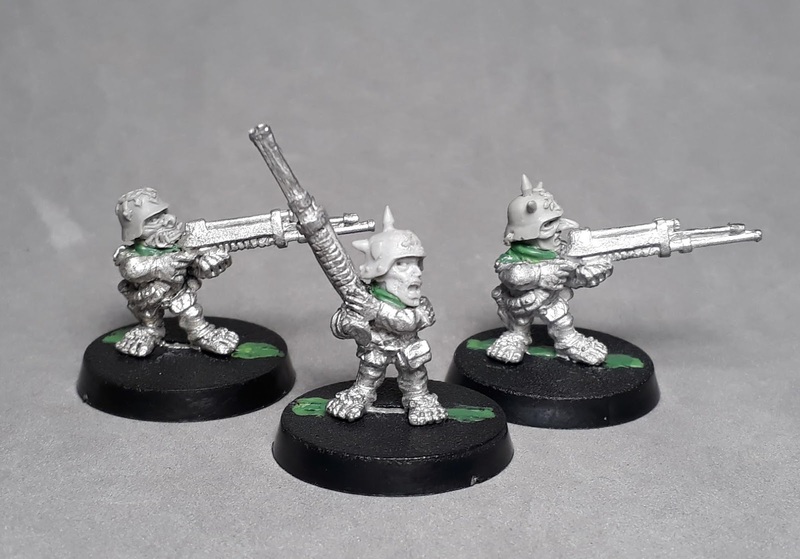 I painted four of the models silver, with the fifth painted gold. The eagle-eyed amongst you will notice that I've added Dark Tongue chaos runes (from Realm of Chaos - Lost and the Damned) to denote the different trophies. The path to embracing the dark gods is not the same for all traitors. Those who defend humanity in full knowledge of the power of chaos have the furthest to fall. An Inquisitor may be tempted by the power and riches of the dark gods. Or they may be corrupted into thinking that chaos can be used against chaos. Or they may become so disillusioned and world-weary, that embracing chaos seems the logical conclusion. The second of my chaos renegade's followers I've chosen to create is my traitor Inquisitor, Drugh. He is a potent fighter in his own right, with an excellent array of wargear. Inquisitor Dirske finally tracks down the renegade Drugh and his followers. 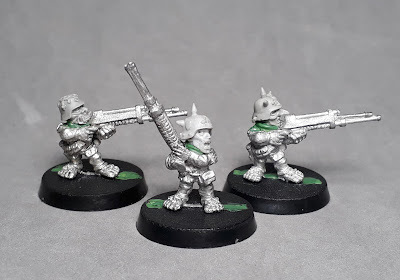 When I rolled up my chaos renegade warband, I think the unit I was most pleased about was the three ratlings. Not because ratlings are iconic followers of chaos (the reverse is probably true), but because I've always enjoyed modelling and playing with figures of a ratling's stature. I even made a full ratling Inquisitorial retinue after all! I already had four or five spare ratlings, so it was a case of selecting three to work out how to chaosify them. To my mind, the key change needed was a head swap. The classic Rogue Trader ratlings have beaming round faces - not the sort of look that a trio of corrupted ratlings would sport. In a case of serendipity, I also happened to have a selection of Maxmini's Fallen Legionnaire heads (left over from an aborted Blood Bowl hobgoblin project). 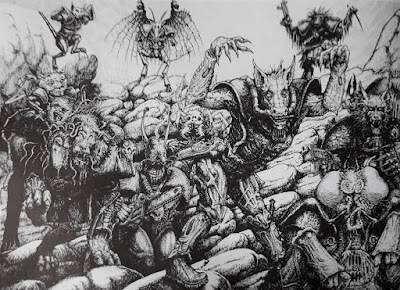 This year as part of the annual Bring Out Your Lead (BOYL) event hosted by Wargames Foundry, myself and a group of friends are going to be playing some Rogue Trader using the Chaos Renegades rules as presented on pages 231-239 of Realm of Chaos: Slaves to Darkness (StD). Note there is a little fettling and fudging to cover available figures and wargear. The set-up is pretty straightforward. Each participant generates their renegade and four groups of followers. Over the course of a day, we will play multiple games in a campaign type system. I've been fortunate enough to have been given a preview set of a fantastic new scrap fort which is due to be released soon in a Kickstarter by Fogou Models. Fogou produce really high quality resin terrain kits. I've painted a number of the excellent frontier sci-fi buildings previously, and I was thrilled to receive an advance set of the new fort. The copy of the fort I've been sent is roughly octagonal in shape, provided with three corner walls, 4 straight walls, a gate (to be located in the 4th corner) and elevated walkways/firesteps for all the walls except the gate.